Unless, Shields’ final work, is the story of why Norah has abandoned her life — “detached herself,” as Reta puts it — but also an existential study of who people are and how they connect with the world. Reta herself is a tangle of contradictions: an acclaimed novelist (and therefore a respected creator) but also a translator (and therefore beholden to someone else’s words); a warm mother but one who assumes control over her three daughters’ lives; a doctor’s wife in Orangeville, Ont., who is, however, not exactly married to the doctor but has lived with him for many years. And now this. Much of this is touched on in the movie version of Unless, but without the richness and arabesques of Shields’ prose, it is becomes a more conventional study in melancholy: a puzzle that is solved. For instance, in the movie, the monologue becomes, “There is a bounteous feast going on but she has not been invited.” The richness and the arabesques, as well as the female exclusion, are excluded. It’s told in straightforward fashion by Irish director Alan Gilsenen (who also wrote the screenplay) whose background in documentaries and TV movies is evident. The ambivalence that is allowed to survive in Unless comes through the voice-over excerpts — “we live content in a world of maybes,” Reta says — and in its evocative setting at the corner of Blood and Bathurst streets, outside the glitzy arabesques of Honest Ed’s department story. Norah (Hannah Gross), the eldest of three Winter sisters, turns up there one day, sitting with her sign and unresponsive to anyone. Her family can’t budge her: Reta and her partner Tom (Matt Craven) sit with her sometimes, and her two teenage sisters visit with gifts of home-baked cookies and tampons. But Norah is the enigma at the centre of the drama. It creates a mood of odd intrigue. In the opening sequence, we see Norah sitting below one of Ed’s carnival signs (“Come in and get lost”) that seem to be an ironic commentary on her spiritual paralysis. On the soundtrack, Leonard Cohen — the inevitable Leonard Cohen — keens the sad ballad Alexandra Leaving (“Say goodbye to Alexandra leaving/Then say goodbye to Alexandra lost.”) Cohen’s Joan of Arc (“Myself I long for love and light/ but must it come so cruel, and must it burn so bright”) would have been a fitting coda. Catherine Keener — who brought a handsome gravitas to such films as Capote and even The Forty Year Old Virgin — plays Reta with the stuttering confusions of a woman living a successful collapse. She recalls “the useful monotony of happiness,” when things were easier. “Once it’s smashed, you have to move into a different of sort of life,” she muses, but we don’t see too much of that. Reta’s relationships — with the French author whose works she is translating and who advises her on the “genetic echo” that may be present in Norah; with her own patronizing male editor who never lets her answer a question; with a literary interviewer who also staggers through a few intrusive queries — lack the fraught complexities that would give Unless a fuller subtext. The movie finds its intellectual anchor only in that old literary concept, the narration; Reta says she is “waiting for that moment of grace or surprise that has left us but will somehow return,” but what we see is a mother waiting for her daughter to come to her senses and return home. It’s a melodrama with a conventional answer at its core. Still, the intelligence and compassion remain, mostly in Keener’s performance and in the trickier, near-silent turn of Hannah Gross as the girl enduring an almost religious crisis. Most of that is in her flat stare, and Gross wisely doesn’t exaggerate the emptiness. She’s a tabula rasa for parental panic, and at those times, you feel the cosmic mysteries that Shields was getting at. 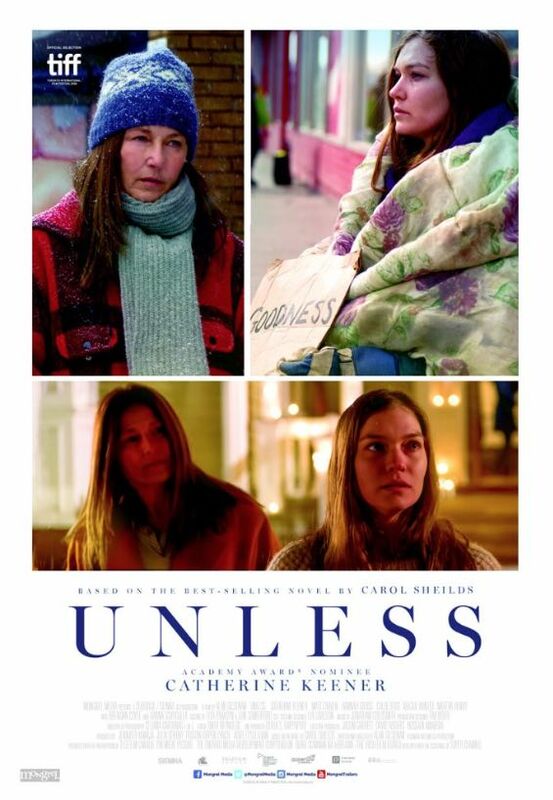 “Unless” is one of the most tangled conjunctions in English, and how can a movie show that? No Replies to "An okay film, Unless you read the book"